"The king was very angry. The king sent his army to kill those people that killed his servants. And the army burned their city. After that, the king said to his servants, 'The wedding feast is ready. I invited those people, but they were not good enough to come to my feast. So go to the street corners and invite all the people you see. Tell them to come to my feast.' So the servants went into the streets. They gathered all the people they could find. The servants brought good people and bad people to the place where the wedding feast was ready. And that place was filled with people." God wants to throw a party! So there will be a party!! Just because many people refuse God and do not accept his invitation does not mean he will forget those who have paid the price to come to the banquet. 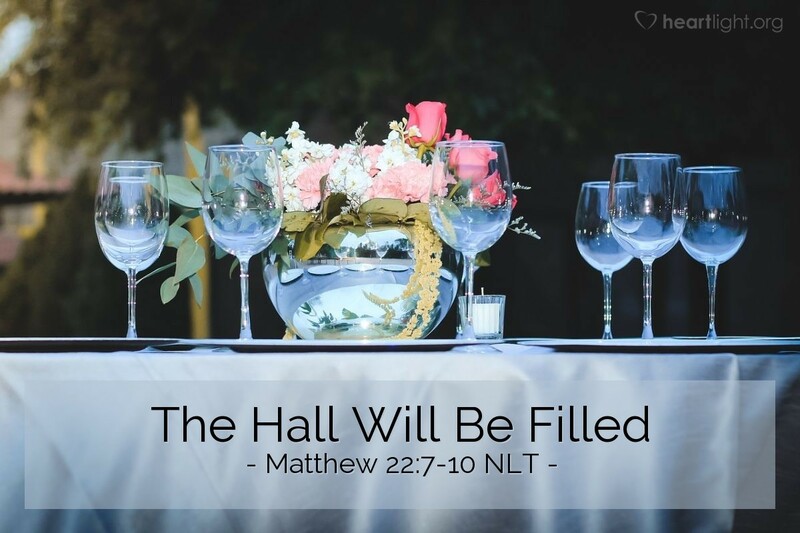 Not only will he reward them, but he is absolutely determined to fill his hall with thankful and rejoicing guests. But he will also deal harshly with those who have dealt harshly with his servants and who have not only spurned his invitation, but been merciless to his beloved children. O Almighty God, I do look forward to the day when all that I hold dear is proved true. While I ache for those who will not know your salvation, I long for the day when those who have honored Jesus as Lord and have received your grace will get to share in his glory. In Jesus' name I pray. Amen.